Reasoning is a game of wits and presence of mind! Yes, it is true and it might seem as the greatest of the challenge after English Section’s surprises but yet this one can easily be dealt with. You just need correct practice and hardwire your brain to quickly make decisions of what to attempt and what to leave. 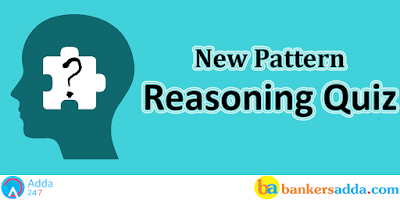 Practice with these new pattern reasoning question for NABARD Grade A Exam. There are eight students A, B, C, D, E, F, G, and H who have to attend the seminar in the months of February, April, June, and September. In each month, the seminar will be conducted on either 9th or 17th of the month. No more than two of them have a seminar on same month. A attended the seminar on the either 9th of April or 9th of September. B attends the seminar after the date on which G attend the seminar. There are two students attend the seminar between the A and C. There is one student attend the seminar between C and D. There are two students attend the seminar between D and E. There are three students attend the seminar between E and F. There is one student attending the seminar between H and E. B does not attend the seminar in the month of April. Q1.Who among following attends the seminar on 17th of September? Q2. How many friend/s attend/s the seminar between D and C? Q3. C attends the seminar on which date and month? Q4. How many student/s attend the seminar between G and A? Q5. Who among following attends the seminar in the month of June? "harder for tourist visit" is coded as “ R*4 H^6 L@2 V%5"
"held the seat since" is coded as " X*4 Z#3 S@2 O#3"
"they were looking for" is coded as "V#3 L@2 M^6 I#3"
Q6.What is the code for ‘speech’ in the given code language? Q7.What is the code for ‘minister' in the given code language? Q8.What may be the possible code for ‘mosque’ in the given code language? Q9.What may be the possible code for ‘fly’ in the given code language? Q10.What is the code for ‘high' in the given code language? These are the latest pattern of coding-decoding questions. In these questions we are applying following concept:- There is special symbol used for specific word. These symbol are based on total number of letter in a word. If there are three letter in word then use @ symbol, for four letter word use # symbol and in the same way for five letter use *, six letter use % and for seven letter word use ^ symbol. Q11. What does ‘Sa’ mean in the code language? I. ‘Pe Bo Sa’ means ‘Look at me’ and ‘Bo Se Pe Ki’ means ‘don’t look at him’ in that code language. II. ‘Ka Ta Ne Sa’ means ‘take me and go’ and ‘Li Wa Si Sa’ means ‘either me or you’ in that code language. Q12. How is Mona related to Monu? I. Soni, the cousin of Monu, is the niece of Mona. II. Swarna, Mona’s sister, is the wife of Om, Monu’s father. Q13. What is Sharwan’s rank in the class of 40? I. Samir, who is 9th from the top in the class is above Shobhit by 12 ranks who is below Sharwan by 5 ranks. II. Nilesh, who is between Sharwan and Sumit, is 15th from the bottom. Sol. if the data in statement I alone are sufficient to answer the question, while the data in statement II alone are not sufficient in answer the question. From Statement I- Point Y is in north-west of point X.
Q15. Who among A, B, C, D and E runs the fastest? I. B runs faster than E but is not the fastest. II. C, though does not run as fast as A and B, runs faster than D and E.